The KO (also known as Knock-Out) card counting system is the most well-known unbalanced technique offered for card counters. Unlike such balanced systems as Hi-Lo or Hi-Opt I the considered technique wouldn't end with 0 when the whole deck of card is counted. 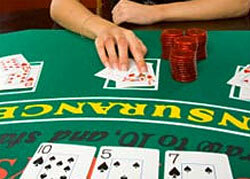 The KO card counting system possesses the extra one small card in contrast with basic systems. Thus the card 7 is counted as +1 instead of generally known and accepted zero-counting. So by means of this very system you will end the whole shoe count with +4 index as there are four 7's in the deck as we know. Here we observe 6 small cards count +1, 2 middle cards count nothing (so-called zero-counting) and 5 standard big cards including 10-value cards and an Ace which possess -1 count. The KO card counting system was created for easier procedure of counting in crowded casinos with much stresses and distractions. To watch and follow the traces of cards in described situation transforms into a real toil. The methodology and basic mechanisms of KO card counting system is presented in the book Knock-Out Blackjack (Olaf Vancura and Ken Fuchs). In order to understand the KO technique and the card counting systems mechanism in a proper way, we advise you to get acquainted with the following example. Imagine your one-on-one playing against the dealer. You get your 2-cards initial hand and the dealer put his face-up card too. E.g. you achieve 3 + 7 and the dealer has King. As you start to play from the first round thus you start to count with 0. In accordance with the KO card counting system chart you count you cards as 0 (initial) + 1 + 1 = 2. And then you just subtract 1 (the dealer King value). With three cards already dealt you have your count numbers +1. Imagine you hit and get another card - 10. Then you subtract another figure one and now the total is 0. You decided to stand, the dealer opens his second card and it's an Ace and that's an automatic blackjack. The round's over. Thus you have -1 count after the first round of playing and you proceed your counting indeed.